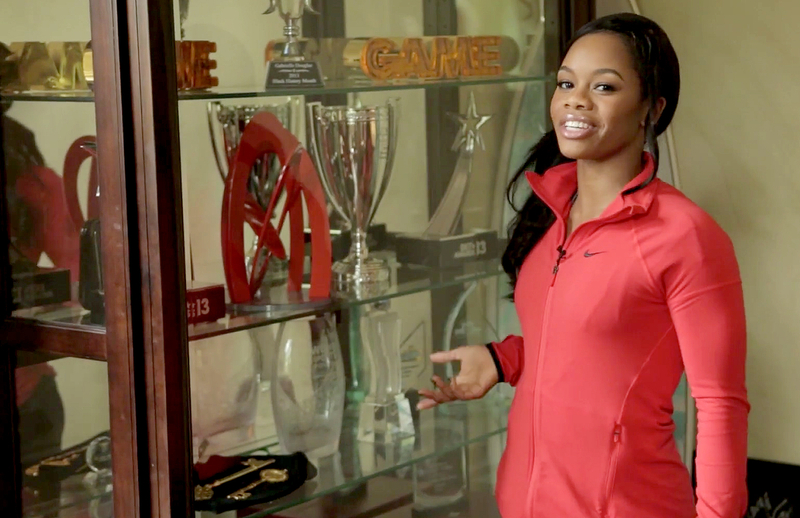 Gabby Douglas put in a lot of hard work at the gym before joining her gymnastics teammates at the Olympics in Rio de Janeiro. In the lead-up to the Games, the 20-year-old shared what her life is like outside of the gym with an exclusive tour inside her family’s Tarzana, California, home for Us Weekly Video. Of course, she also gave Us a look at one of her gold medals from the London Olympics — the most important piece in her trophy case! The Gabbymoji creator also showed off her expansive closet and explained the differences between getting ready for practice, which takes only 15 minutes, and walking the red carpet. “For an event like a red carpet, it usually takes me a long time to get ready, just, you know, because you have to get glammed up, and I love to get glammed up,” she admits. Her closet was filled with shoes, and she called out some of her favorites, like her beloved suede black Nike sneakers. With so many Nike sneakers from her sponsor, she says she loves to share them. The Douglas Family Gold star also took us inside her kitchen, but her mom, Natalie Hawkins, tells Us, “Gabrielle doesn’t cook! Since the home tour, Douglas tried to defend her title during the semifinals in Rio. On Sunday, August 7, she missed her chance when teammates Aly Raisman and Simone Biles earned better scores to move on to the finals. To learn more about the Olympic champion’s home life, watch the video above! Women’s gymnastics kicked off at the Games Sunday, August 7, at 7 p.m. ET. Stay with Us Weekly throughout the games for continual coverage, including interviews with the biggest athletes and exclusive behind-the-scenes content.